Anderson Rowntree, a leading law firm in West Sussex is using The Conveyancing Map to explore their competitive position in the region and inform their strategic planning. The reports they commissioned provide the elusive empirical base so often missing from the business planning of law firms. The Conveyancing Map has been brought to market by Richard Hinton a former Marketing Director at Shoosmiths and latterly Head of Conveyancing at LexisNexis Visualfiles and subsequently Business Strategy Director at Searchflow. Just how fast is the structure of the conveyancing industry changing? For some of the more excitable commentators, the High Street is being consumed by a rapacious cabal of volume conveyancers in league with the panel management industry to drive conveyancing away from traditional firms and into production line factories. The truth however seems altogether less dramatic and more encouraging for the wider conveyancing community. The industry is certainly characterised by a long tail. The large specialist conveyancers that have emerged over the last 15 years are small in number but command significant volumes of cases. The market share of just the top 100 firms is an impressive 26% and more than half of all conveyancing is managed by 500 firms who themselves represent just 12% of the total of 4,182 firms that acted in more than 10 purchase transactions pa. But is this share growing? When comparing the structure of the industry across 2013, 2014 and Q1 2015, the change is very modest and much broader than perhaps expected. Every segment of the top 1,400 firms grew their share marginally in 2014 although in Q1 2015 firms outside the top 100 fell back slightly. The top 50 firms however, only managed to increase their share by 0.9%. The strongest segment growth was amongst firms ranked 201st to 500th and even here, the increase was only 0.8%. Together, the top 1,400 firms grew their share from 77.3% to 80.1% whilst the remaining 3,400 firms saw their share fall from 22.7% to 19.9%. Across the two years and the first quarter of 2015, the number of firms acting in a material number of cases (more than 3 residential purchase transactions a quarter) fell by 8% from 4,498 to 4,146 demonstrating that there is a very real and steady industry attrition as firms either merge, close or step away from conveyancing. It would be wrong however to think that it was just the very largest firms that are growing their share. Growth is spread across the top 1,400 firms who all seem to be in rude health. We hope you like our new shop window! Any feedback would be most welcome but we hope it serves to flag the very real benefits the Conveyancing Map offers; the growing breadth of its proposition (with the latest addition of estate agency sale data) and the different ways in which firms can enjoy the benefits of the tool. To complement the existing conveyancer datasets, The Conveyancing Map has today added data showing which agent acted in which residential property sale. Commenting on the move, Richard Hinton said, “clients were telling me that the logical extension from the business insight they glean from the conveyancing data, was to add a business development layer by showing which agents acted in the sale”. Clients can now track the performance of estate agents in just the same way as they already can for conveyancers. Early market testing with conveyancers has been very positive. 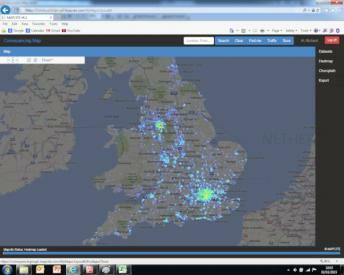 Richard Hinton of Pitsford Consulting Limited has just launched The Conveyancing Map – a new business intelligence tool displaying on an interactive map all residential property transactions in England and Wales with the name of the firm acting in each purchase. Just what is The Conveyancing Map? The Conveyancing Map is a new product that has extensively refined, cleansed and improved authoritative Land Registry housing transaction data. Crucially, it includes the name of the conveyancing firm acting in the purchase. This data is then made available as an online service that allows a user to search, filter and export using an online mapping tool. It already holds the detail of more than 1.2 million transactions and its updated quarterly. In what ways is the Map useful for law firms? ‘Competition in the conveyancing market has increased dramatically in recent years. The growth of national and regional conveyancing firms, the arrival of external funding & new entrants and the growth in panels have all contributed to an ever stronger focus on competition. More than ever before, conveyancing firms need an early understanding of how they are performing, when they are under threat and where their growth opportunities are. The Conveyancing Map allows a firm to track its market share month by month and compare it to its rivals. Market share is the acid test of a business’s performance as opposed to simply relying on file opening stats. A rising market can hide the stronger performance of rivals and a falling market can disguise opportunities. Market share KPIs should be viewed as the Gold Standard. As well as this new operational transparency, The Conveyancing Map is being used by law firms to craft factual-based marketing messages for clients and introducers; to shape geographical marketing campaigns and in some cases, provide due diligence in support of mergers, acquisitions and office reorganisations. How long have you been producing the Conveyancing Map? ‘It’s brand new – less than two months old. I’ve been delighted by the reaction to it. People warm to its simplicity and the strength of the data. I’m pleased to by the endorsement of well-respected organisations in the field – The Bold Legal Group, Legal Eye and LawNet amongst others have all seen it in action and have been quick to endorse it to their memberships. ‘I have a background in law firm marketing – for 12 years I was the marketing director at Shoosmiths, then I worked at LexisNexis on the legal case management side and most recently I was with SearchFlow. So I have 25 years of experience in the property industry and throughout all that time I’ve been conscious that there’s a dearth of good business intelligence for lawyers to use when planning how to develop and grow their businesses – it’s been niggling at me. I’ve been in roles where I’ve been required to understand what the conveyancing market is doing as a whole or trying to understand the competition and it largely comes down to hearsay. How easy is to use the Conveyancing Map? ‘It’s all hosted and clients have a user name and a login and all the information is there – immediate and accessible – at their fingertips. I’ll produce a report if a client want it but the software is so easy to use that most would rather access it themselves. Pricing is based on the size of a firm’s conveyancing operation and online access starts from £595 pa which of course includes the quarterly updates. Alternatively, firms can commission a bespoked report the price of which is again linked to the size of the conveyancing operation and starts from £295. What are your long term plans with the Conveyancing Map? ‘At the moment it’s just focussed on residential property but we could move into the commercial side. Equally there’s other data out there that’s relevant to the home moving industry that we could add to build an even richer picture. So we’ll see. Members of the Conveyancing Association (CA) accounted for more than one in 7 of all UK housing transactions in 2013 according to research and analysis by the new Conveyancing Map business intelligence tool. The Conveyancing Map shows study found that of the 802,400 residential purchases completed in 2013, CA members were responsible for 115,511 accounting for a total of 14.45% of the market. In monetary terms, the results showed that the CA members bought £26 billion worth of UK residential property on behalf of clients. The Society of Licensed Conveyancers (SLC) has today announced a tie up with the newly launched Conveyancing Map with a special deal for its members. The new on-line tool allows conveyancing firms to undertake a comprehensive analysis of the markets in which they are operating and use the outputs to tailor their future approach to marketing and business development and planning.